Microsoft Office Word is one of the most used word processors in the world. This application is made by Microsoft, well known for Windows, and is part of the Microsoft Office package that contains Excel, Access and PowerPoint. Word offers users comprehensive support in creating letters, reports, etc., including spell checking, text formatting facilities like tables, WordArt, and lot’s more. Today we’re going to show you 15 very useful MS Word tricks you probably never heard of. Metadata is the confidential information within a document i.e. properties, firm name, author‟s name etc. If the document was sent electronically and was intercepted by an unwanted party, the information could be used inappropriately. All Word versions have the functionality to remove Metadata, but Word 2007 has made the process simpler, by bringing the functions to the forefront which means fewer clicks to the user. The function in the current version of Word is referred to as Inspect Document. To remove hidden metadata go to the Office button (big circular button in the top left corner of Word), click Prepare, Inspect Document, and the Inspect button. The system will then search for metadata and other content overall, or by specific content e.g. revisions. The user will then be given the options to remove all hidden metadata, or only specified content. This is a brilliant tool for those who are not savy with styles and numbering as it copies formatting from one part of the document to another. The icon is the same in all Word versions – in 2003 it can be found on the Format toolbar, in 2007 it can be found on the first group of the Home toolbar. To use this tool, place the cursor in the text containing the formatting which is to be copied, click on the Format Painter, then highlight the text you wish to copy the formatting to. The Format Painter will copy any formatting, it does not limit itself to styles and numbering, but it is case sensitive. To copy formatting to several points throughout the document but not to all of the content at once, double click on the icon to keep it selected. Quick Parts and Building Blocks replaced the majority of Autotext in Word 2007. Autotext is a function more commonly found in Word 2003 that auto completes words, sentences and paragraphs as they are typed. It even works with symbols and images. This function can also be user defined which is handy if you need to repeatedly insert the same paragraph into documents. Autotext can be used in headers and footers too it is not limited to just the content of the document. Word 2007 introduced a substitute tool to Autotext. Instead of the program „auto completing‟, the words, sentences and paragraphs can be saved under an autotext name e.g. “Company Logo”. When this name is typed and then F3 is pressed it completes the rest of the words, sentences or paragraphs. To save text as an autotext Quick Part in Word 2007, highlight the word, sentence or paragraph, go to the Insert toolbar, click Quick Parts and select Save Selection to Quick Parts Gallery (previously used Quick Parts will appear in the gallery view). A box will appear type in the name you wish to use for your autotext, set the Quick Part as Autotext and then press Save. The next time you wish to use this text all you need to do is type in the autotext name e.g. “Company Logo” and press F3. This can be cool and not so cool. Link to Previous in footers literally does that, it links to the previous footer. This function can easily be switched off if you wanted a different header or footer for example on page 3 to page 4 because it was relating to a different section. The key trick to changing footer content is to make sure a Next Page Break has been inserted on the page above. To do this in Word 2007 go to Page Layout and Breaks (or the Insert menu and Page Break in Word 2003). Then go to the footer on the next page, double click to open it and click on the Link to Previous button. The page break will isolate the information above enabling the footer you are in to be altered without affecting the footers above. This method will can be used several times through the document and is good if your document contains several sections. If you wish to have a different header or footer on the first page as opposed to the other pages in the document, double click to enter the header or footer and tick the box Different First Page. This can be found on the Design toolbar which automatically appears when you enter the header or footer in Word 2007. This is a new function in Word 2007. By highlighting text and clicking the Clear Formatting button the selected text will revert back to default font and size. This is a quick and easy tool which can be found on the Home toolbar which not only changes the text back to its original form, but it also removes any styles and formatting. However, if Metadata is what needs to be removed it is best to use the Inspect Document feature shown above in tip 1. There are two ways to quickly zoom in on content in Word. By holding down the Ctrl key and rolling the mouse wheel forwards and backwards to increase and decrease the zoom, this works in many programs as well as Word. Or you can use the new setting Word 2007 which is the Zoom bar down the bottom right of the screen just above the clock. By holding down and moving the bar from left to right you will see your screen zoom in and out again. The carriage return icon is a backward looking P symbol which can be found on the Standard toolbar in Word 2003, or the Home toolbar in Word 2007. It is unwelcomed by some as they find it hard to see the text whilst the carriage returns are displayed on the screen, but for those who regularly format documents this symbol is worth its weight in gold (so to speak). Carriage returns do not appear on printouts but do help avoid several potential issues by telling you the character and paragraph spacing, and whether the text has a style or automatic numbering applied allowing you to be really intricate with your document production and revisions. Bookmarks are similar and are a great feature for marking the location or position of text within a document. They are commonly used in templates and precedent documentation. Bookmark knowhow can lead to less document template corruptions as if the bookmark is deleted this can corrupt a document and make it so it cannot be opened. To view bookmarks in Word 2003 click the Tools menu, Options, then the View tab and select the Bookmarks check box. In Word 2007 go to the Office button, click Word Options, Advanced, and then select the Show bookmarks check box under Show document content. This was previously under the Format menu in Word 2003 and is great if you typed several words with the CAPS LOCK on or if you wanted to transform everything into CAPS. In Word 2007 it is an icon found on the Home toolbar with a drop down arrow contained which expands into a menu. From here the correct case can be selected. Another way of changing the case to ALL CAPS or no caps is click on the Font group on the Home toolbar and untick the ALL CAPS option. This one is no surprise and is probably one of the most used functions and short cut keys with PC users. Ctrl + Z is the shortcut key that undos the previous command if typed in error, or if the program has auto corrected something you didn‟t want changed. For example in all Word versions if you type (c) it turns into the © symbol, to change it back to (c) press the undo key or Ctrl + Z. Another example is if the drawing canvas inserts when you go to add an image to your document. Press the undo button to remove the box and insert your image. Hyperlinks are always cool because they send the user to another part of the document, or a website without the user having to scroll or type anything in. Hyperlinks can be displayed as anchor text or in full. In Word 2007 the hyperlink function can be found on the Insert toolbar, or in Word 2003 on the Insert menu. The shortcut is Ctrl + K, which will also open the Insert Hyperlink dialog box. In this box the user will receive four options. They can either insert a hyperlink to a web page, place in a document (again the place in the document will need to be appropriately styled for the link to be picked up), to create a new document or an email address. Quite a few firms use hyperlinking as a cross referencing tool (even though this is a separate function completely in Word) or as a way of making up electronic bundles or a page indexing a folder of different documents. The Quick Access Toolbar (“QAT”) sits along the top of the main toolbars (also known as Ribbons) in Word 2007. The QAT was introduced so the user could set up their frequently used icons without having to continuously click through the toolbars. It also helped users adapt to the new layout in Word 2007 from 2003. To set icons so they show on the QAT, you can either click on the drop down arrow at the end of the toolbar and select from the list, or you can press More Commands to be taken to the list of all icons. From there you can add or remove icons from the toolbar making it truly unique to your working pattern. Form tools were moved in Word 2007 to their own toolbar called Developer and renamed Legacy Forms. The form buttons allow objects like checkboxes and drop down fields to be inserted into a document which are ideal for surveys and questionnaires. When saved as a template the form cannot be edited other than the checkboxes and form fields that have been inserted into the document. ActiveX Controls were also introduced and grouped with the form buttons. ActiveX Controls allow more interactive commands to be inserted and quick boxes that developer programmer types can code. Legacy Forms and ActiveX Controls are cool because they show another avenue of Word‟s versatility. Text Wrapping is a feature that allows the text to display around a picture much like if the document is to be displayed in column format. To display the text wrapping features, right click on an image, click on Format Picture and select Layout. In Word 2007 the toolbars will automatically change to display the picture tools, a text wrapping button will appear on the Format toolbar. In the Format Picture dialog box, the options Square and Tight will allow the text to flow around the image. In line with text will place the image on the same line as the text not around it, and the other two features Behind Text and In front of Text speak for themselves. Applying text wrapping to an image will make it more flexible and easier to move (for example using arrows keys) amongst the text. In addition the positioning of your image can also be defined further with the Horizontal Alignment options so it can be shown to the left, center or right of the text. Displaying information in tables is a great way of segregating text and objects evenly and with or without gridlines. Placing the information in a table as opposed to setting tab makes it easier to control, and if you find that later on you do not want the information aligned in that fashion then you can drag and drop the information out of the table without have to realign everything. 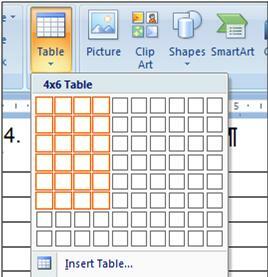 Word 2007 amended the table function slightly by adding a table button that when you hover over the squares to create your table, the table appears behind the box so you can preview it before you have inserted it. This is not just a Word feature and is the solution to the majority of text formatting and document corruption problems. For example, say you wanted to copy or insert some text from a document you have received via email, the metadata formatting may be unknown to you. Rather than copying all of this information with the text content into your document and potentially corrupting it at a later date, it is always wise to highlight the information, click Copy and then go to your document, select Paste, then Paste Special and Paste as Unformatted Text. The text will appear with no formatting on whatsoever keeping your document safe. You can then renumber, or restyle it accordingly either by applying a set style or using the Format Painter to copy the formatting already within the document. As with most features of Word 2007 when you insert something the toolbar will automatically change at the top giving you all of the functions you need for that particular object. By right click on the columns of tables you can also insert and delete rows and columns, and merge random cells crafting it into the format you wish. Do you also know some good MS Word tips and want to share them with our readers then feel free to include them in your comment. This entry was posted on Friday, June 25th, 2010 at 10:53 and is filed under Articles. You can follow any responses to this entry through the RSS 2.0 feed. You can leave a response, or trackback from your own site. My day job is a legal IT Trainer dealing with all PC application queries and training relating to Microsoft, intranet/extranets, web, and document/practice management systems. Outside of work I create digital art under the fantasy genre. I have written two novels. #1 is one of the things I always mention to people. I can’t tell you how many times I’ve received a document from someone and when I look at the metadata, it discloses something that they might not have wanted disclosed. That metadata carries over into PDF files too, so if you convert your document to PDF it will stick with it.